Of all the treasures and wonders of the summer season, for me, the most revered are the colorful, aromatic, fresh herbs and flowers. Roadsides, railways, gardens, and mountainsides are all alive with wild flowers and plants and dragonflies, butterflies, bees, and winged creatures of all sizes delight in their presence. 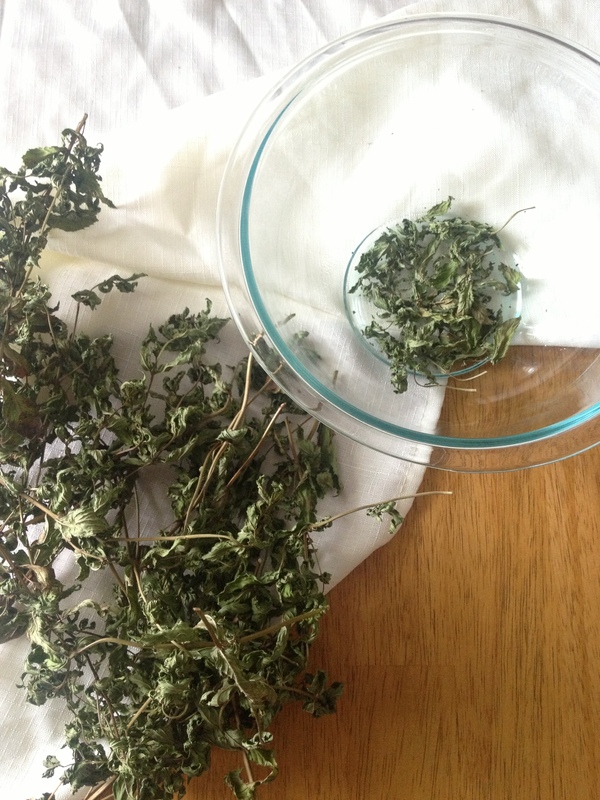 After months of using their dried counterparts, fresh herbs remind us of the true vitality and essence of herbalism. There’s nothing quite like waking up, going out into the sun, and bending down to pick a few leaves of mint, lemon balm, sage, or verbena and making a fresh infusion. A cup of fresh Lemon Balm leaf tea makes the dry version pale in comparison. Working with fresh herbs and flowers is one of the sweetest experiences one can have, and now is the time for these moments. Naturally, we seek to preserve the fresh herb experience much like one seeks to preserve memories through photographs, feelings through a journal, keepsakes through a time capsule buried in the earth for future discovery. This season, I have enjoyed the blessing of a bountiful little herb patch that began with only a few small starter plants and seeds, and has blossomed into a thriving plant community regularly visited by dragonflies, butterflies, and the like. I am astonished each time I visit at the rapid growth and the incessant offering of Calendula blooms, lavender buds, basil, thyme, sage, lemon balm, parsley, and rosemary. The garden’s growth exceeded my wildest dreams and it seems every day the leaves have multiplied once again, and even after leaving behind plenty for other visitors, I am left with an abundance of plant material to take home. One of my favorite recipes that I developed inspired by my own garden is the follow facial toner, called Shades of Green because as it brews, it goes through stages of greens, leading ultimately to a deep, forest green that alludes to its powerful natural healing gifts. I believe the parsley lends a deep glow to the skin, while calendula can heal past damage. The lavender was added for beauty and inspiration, and also lends a cleansing, astringent effect. Gather enough Calendula blooms and leaves, lavender buds and leaves, and parsley leaves (you can try root here too) to fill the jar to the top, but not over-stuffing completely (there should be enough space for the herbs to move around freely when the liquid is added.) Fill 3/4 of the jar with vodka or witch hazel, and the rest with water. Swirl the herbs around, and leave in a sunny spot for 2-3 weeks. At first, the liquid will turn a bright emerald green, then watch it daily as it absorbs the vitamins, minerals, and magic of the plants – changing to a deep forest green. When the leaves and flowers look as though they have given all their color away, you can begin to use the toner. I like to leave the plant material inside while I use it, then eventually I strain it and store it in a small jar with a spray pump for easier application. Use: I like to apply a small amount to an organic cotton ball and use it to clean my face – great when camping! 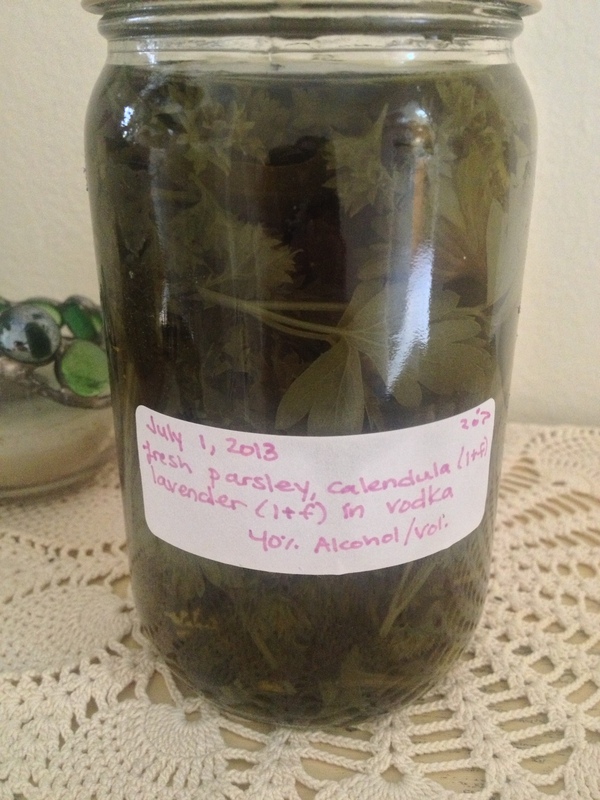 Feel free to experiment with the ratios of the herbs – I used more calendula and parsley, and a few lavender sprigs. Go with what you have on hand and let your garden’s supply inspire you. Be well and be beautiful. Now, we are in the deep midst of summertime, when it’s brighter out the window than I ever remembered it being, when the cicadas’ crescendoing hymns rise and fall to a rhythm of their own, when the gentle breeze on my second floor apartment permeates the heady scents of the spearmint, lemon balm, sage, and lavender bushels hanging from every which hook I could find to dry them, in the effort to store them and all these things, for the Autumn and Winter. 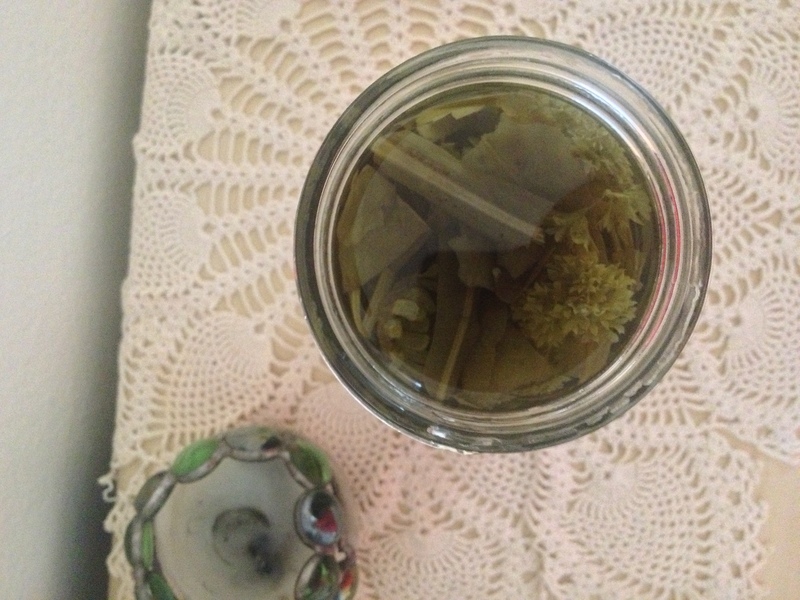 I love infusing herbs in oils, water, alcohol, and vinegar in the sunshine, under the moon, out in the open air, the rain, the dew, the birdsongs, the cicada chorus, because it allows nature to be infused into them. Later on, in a few months when all these intricacies of summer will have passed and I’ll have forgotten how bright it can be outside, I’ll be able to access the energy of summer through these herbal infusions in the forms of teas, tinctures, oils, vinegars, and balms. Their scent will remain secured in glass jars; and scent being the most poignant sense, with the greatest power to evoke memory, will momentarily transport me, calm me, instill hope in me, for a future time and place. I recently learned that the sense of smell is intrinsically linked to the future, redemption, and to the next world, and that is why in the Jewish Havdalah ceremony that is made after the Sabbath, a second blessing for the spices is not made, because scents are already completely elevated and of another realm and plane of existence. Summer’s gift is one of bright light, openness, and carefree joy. A wild, uninhibited bounty of plants and flowers burst from the Earth, offering us more than we can even imagine having. My own tiny garden plot at my parent’s home is no larger than a few square feet, yet the bounty seems to be endless. I believe this is nature’s way of helping us get through the future seasons, by harvesting, drying, and storing herbs and other gifts. Autumn, Winter, and Spring have their own gifts that are each so beautiful and perfect – each so vital. It’s a blessing to live in tune with the seasons, to look into the eyes and heart of each one and determine what is its essence, its teaching. Summer is generous and full. Today, driving with my husband down the bright road, planning a trip out on Long Island to harvest more wild plants, I realized we must seize the seasons. 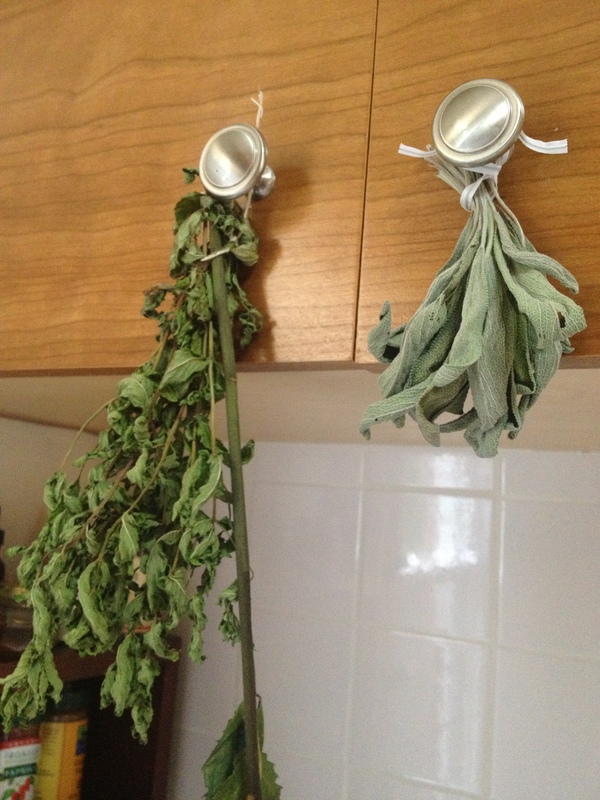 My favorite way of drying herbs (and the most practical for apartment living) is to gather bushels of herbs from the garden or the wild and tie a string around the stems. Separate the sprigs a bit so that there is room for air to circulate. I then hang these beautiful bouquets upside down from hooks, strings, or even cabinets in the kitchen. They should be kept out of direct sunlight, close to a window where air circulates. If you want to preserve the color of the herbs more, or protect them from light or dust, you can cover the bushel with a brown paper bag, with the stems at the opening of the bag. Then, cut open the bottom of the bag, and cut slits in the sides for more air ventilation. Check if the herbs are ready by feeling if they are crunchy and completely dry. When they are, take them down and pull off leaves into a bowl. Preserve the leaves in a air-tight jar in a dark, cool spot. This past winter solstice will forever be cherished and remembered, a time when 12 herbalists from all over the country joined a ring and shared gifts, love, and inspiration through the post. This second batch of gifts were as magical and beautiful as all the others, bringing some extra warmth and excitement in the mail through the cold crisp afternoons of January. Wunder Budder’s colorful gifts including an aromatherapy stick! Blue Turtles sacred and magical gifts from Arizona’s deserts! Lavender Oatmeal Flower Fairie Soaps from Sierra and Chas of Forest House Herbals – lovely! I love the medicinal vinegar infused with Moringa, an herb I was unfamiliar with before Paula sent me these gifts. Moringa is a “miracle tree,” with a super-high mineral content and a plethora of gifts. Paula is from South Florida where she grows and harvests this plant and uses it for salad dressings and soups, and as a water purifier. I adored Wunder Budder’s Dark Mint Lip Balm and Super Soft Salve, truly versatile and blissfully simple herbal salves – the way it should be! Darcey Blue of Blue Turtle Botanicals sent me an exotic tube of Sacred Treasures Resin Balm with Frankincense and Myrrh along with a Winter Mist Tea blend and a Winter Solstice Elixir. So special – I could smell the earthy, botanical scent of Darcey’s Arizona-based herb farm the moment I opened the box! Lastly, though this special friend didn’t take part in the larger Solstice Swap, we did our own little barter for these lovely, heavenly Flower Fairie Herbal Soaps by Forest House Herbals. I received these amazingly soft, lavender and oatmeal soaps with beautiful packaging depicting fairies (my favorite) in exchange for a year’s subscription to the Starry Eyed Herbalist. They were so special that I waited to use them and last night I finally did, the soap is so soft and lathers up with the beautiful scent of lavender for a truly relaxing experience. Thank you to all the special green women who shared their gifts with me this Winter. We formed a ring of 12 herbalists, some strangers, some old friends, all united by a love of herbs and a spirit of sharing and healing. On the online herbal marketplace Poppyswap, one woman sagely decided to revive a lovely practice called a “solstice ring” in which 12 herbalists would each create 12 unique gifts in time for the Winter Solstice. Each herbalist would then send out a gift to each of the other 12 participants, so in the end nearly 150 packages traveled all over the country, from NY to Washington and anywhere in between. For the past couple of weeks it seems not a day went by without receiving a magical package on my doorstep. The fresh scents, creative packaging, and unique artisanship that went into these creations were breathtaking and inspiring. I finally sent out the last of my packages today and so I have decided to share part of this experience tonight, as the Winter Solstice is just hours away…It’s been an honor to partake and I hope all the love and generosity exchanged will continue to bring healing, warmth, and joy throughout the Winter season! Check back soon for the rest of the gifts as well! a harry-potter inspired package from Worts+Cunning Apothecary that brought a huge smile to my face at my front door! 3 delicious tea blends and a special chocolate and mint glycerite from Worts+Cunning Apothecary. Lovely! a colorful package from Good 4 You Herbals with mint scrub, cleavers tincture, yarrow balm, and apricot shimmer salve! Seeds of calendula, st. john’s wort, poppy, echinacea, and tobacco from Green Journey Seeds! Liquid soap, cinnamon myrrh salve, and 3 little perfumes from Rosemary & Rue! Cinnamon skin body oil and autumn harvest tea from Twysted Thystle! Luxurious soap and honey rose elixir from Maya Made! Coconut Herbal Balm and Rose Pine Face oil from Wildly Natural Skincare! Lemon grass body butter, elderberry elixir, and goldenrod flower essence from Herbal Revolution! …..and a Special offer! Comment on this post or on my Facebook Wall to be entered to win a Solstice Gift from Gem Botanicals. 3 winners will receive a handmade energy amulet filled with white sage, yarrow, or st. john’s wort! Contest ends 12/31/12.